There are many elements at play when it comes to crafting a truly amazing red carpet look. From choosing complementary jewelry to selecting comfortable undergarments, no detail is too small for celebrity stylists to consider. But when it comes down to it, we could argue that there's one very easy way to guarantee a red carpet home run: Find a killer pair of statement shoes. 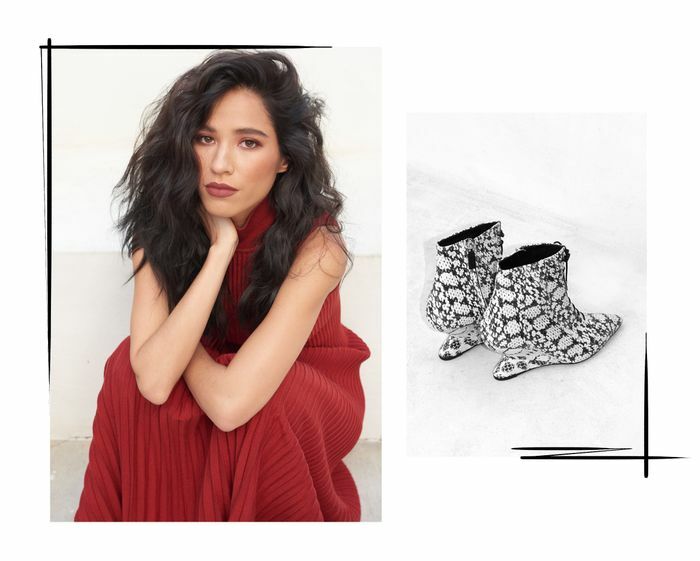 Actress Kelsey Asbille and her stylist Danielle Nachmani certainly know this to be true. Ahead of last night's InStyle Awards, Who What Wear got ready with Asbille, who you may recognize from her TV show Yellowstone (also starring Kevin Costner) as well as roles in Teen Wolf, Wind River, and One Tree Hill. Asbille attended the award ceremony with Salvatore Ferragamo, naturally wearing the label head to toe. She selected a red knit turtleneck dress from the Resort 19 collection—which looked about as comfortable as a red carpet dress could possibly be—along with the label's black suede evening clutch and the truly showstopping pièce de résistance: black-and-white snakeskin lace-up wedge booties. Scroll down for our exclusive interview and shoot with Asbille to get to know the up-and-coming actress. Tell us about your look for tonight. What’s your favorite part of the outfit? This dress is powerful in its simplicity. I was immediately drawn to the color. It seemed fitting to let the shoes do the talking, given Ferragamo’s legacy as Hollywood’s OG shoemaker. Hair and makeup is always its own art of expression. Kelsey Deenihan and Renato Campora always make me feel empowered when I leave the house. What was the collaboration like with your stylist? How many options did you go through to find the right look? Danielle is the master of a small edit, which I love. This was the first look from Resort 19 she wanted me to try—it was the first dress I tried on, and I immediately knew it was the one. It’s a natural collaboration, as she really gets to know me, what I like and don’t like, and makes me feel confident as well as the best version of myself. Why is Ferragamo a good match for your style? Ferragamo was my first introduction to the fashion world at 18. My first fashion show. The pieces I have from that time will be in my closet forever, or until I can pass them down to my children. Their designs are timeless. For this season, in particular, I love Paul Andrew’s sophisticated sense of color for the house. For the red carpet, I think it’s important to be thoughtful without taking yourself too seriously. What are the most comfortable shoes for the red carpet? Do you have any tips for staying comfortable in heels? Wear Ferragamo. It’s no surprise given their history. They are the most comfortable shoes I’ve ever worn on a red carpet: very light but give you added strength. Do you wear any special undergarments for red carpet looks? If so, what are your favorites? Next up, discover the sneaky $8 item celebs wear on the red carpet.